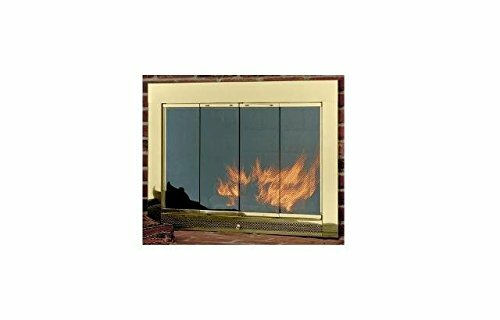 Hearth Craft 04713f Slimline4029Pol Fireplace Door-Masonry, Polished Brass, 40 x 29 In. Product prices and availability are accurate as of 2019-04-19 09:00:28 EDT and are subject to change. Any price and availability information displayed on http://www.amazon.com/ at the time of purchase will apply to the purchase of this product. Many consider this to be the best value we offer. The intricate bottom filigree pattern and built in damper control bring your fireplace a touch of the traditional look.Features. Trimless full-fold doors open 180 degrees for enhanced viewing.. Ease of cleaning and safety.. Comes standard with 316 in. clear tempered edged glass and mesh curtain.. Color - Polished Brass. Dimension - 40 x 3 x 29 in. Trimless full-fold doors open 180 degrees for enhanced viewing. Ease of cleaning and safety. Comes standard with 3/16 in. clear tempered edged glass and mesh curtain. Color - Polished Brass Dimension - 40 x 3 x 29 in.